The Missouri Association of Insurance Agents (MAIA) hosted the Small Agency Conference in Columbia, Missouri from March 20-22. As a Platinum sponsor, Barton Mutual had a booth space for the trade show on the second evening. 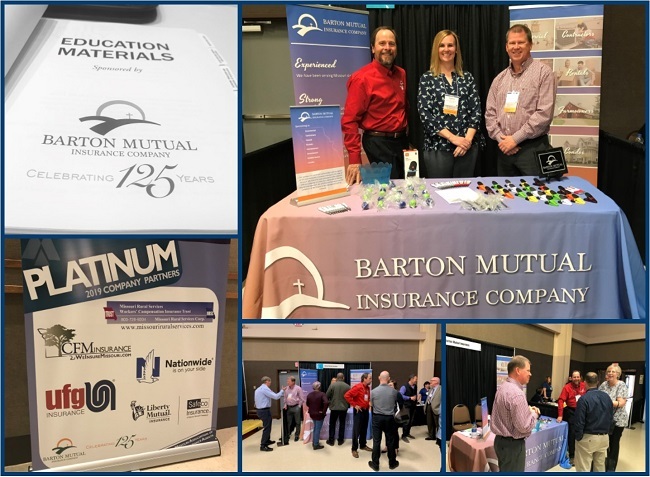 Brian King, Dave Barrett, and Tabitha Beaman attended the conference and represented Barton Mutual at the trade show. Many other insurance companies and other vendors were present and a large number of insurance agents attended the event. It was a good opportunity for company representatives to connect with current and potential agents, as well as network with other insurance companies and check out the products and services offered by vendors. Barton Mutual offered a portable Bluetooth speaker (that floats!) as a giveaway item. Jason Reynolds from Angell & Company was drawn as the winner. The booth was also stocked with some freebie items: magnetic chip clips, pens, lip balm, and tire gauges.